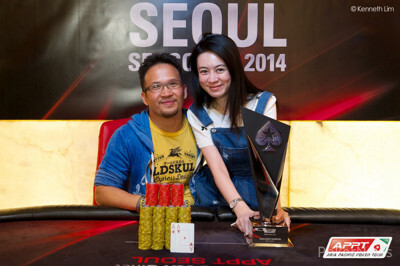 Chane Kampanatsanyakorn Wins APPT Seoul Main Event (₩150,000,000)! 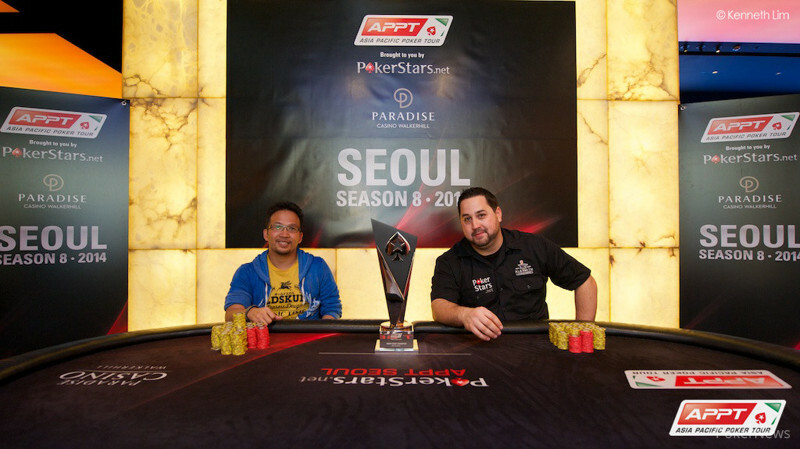 After an epic final day of the PokerStars.net Asia-Pacific Poker Tour Seoul Main Event, it was Chane Kampanatsanyakorn who took home the trophy, the glory and the first-place prize of ₩150,000,000 ($142,200). The third day of play started with 24 players, and it took almost 15 hours before Kampanatsanyakorn could finally smile for those classic celebratory pictures. Kampanatsanyakorn finished second in this exact same event last year to Aaron Lim, and to make this victory even sweeter he also became the first-ever APPT winner from Thailand. With 24 players returning to action, many had to go before the final table was reached. 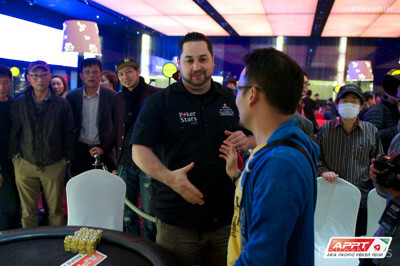 Along the way, such names as Takahisa Watanabe, Kelvin Beattie, Raiden Kan, and Andy Chan fell before 10 players remained. This is where start-of-the-day chip leader Jeffrey Holbrook headed out the door in 10th place. The blinds at the final table were rolled back to a 40-big blind average, as is a custom on the APPT, but right away two players were in an all-Japan clash. Shinya Umano knocked out both Kosaku Akashi (9th - ₩ 15,433,200) and Makoto Yoshimichi (8th -₩ 20,560,000), which brought the field down to seven quickly. In seventh place, Sugimoto said his goodbyes when he ran ace-five into Cohen's ace-queen suited. The board brought no help and Sugimoto took home ₩25,700,000. Four double ups took place after Sugimoto was knocked out, then Marshall was the next to go. The American based in South Korea ended up all in holding ace-jack against Winfred Yu's ace-queen and that did not turn out in his favor. Marshall took home ₩32,550,000 for his sixth-place finish. Then, after a tough battle for fifth place, it was ultimately one of the more experienced players who hit the rail in Yu. He took home ₩41,120,000 for his fifth-place finish. A few hands after Yu's bust out, Shinya Umano was eliminated fourth place for ₩49,690,000. This prompted the final three players to play for about 10 minutes before a deal was discussed. After making the deal, there was still ₩30,000,000 ($28,500), including an HK$100,000 package for the ACOP Main Event in November, waiting for the winner. Cohen would not be the winner, though, as she hit the rail just moments after the deal was made. When heads-up play started, Kampanatsanyakorn had a decent lead with 2.95 million versus Christian Haggart's 2.1 million. After about 90 minutes, it was all over as Kampanatsanyakorn kept Haggart at a distance before knocking him out holding pocket aces. Haggart was gracious in defeat and complimented his opponent with his excellent play before Kampanatsanyakorn finally hoisted the trophy he so desperately wanted. Thank you for following the PokerNews live coverage from the Paradise Casino Walkerhill in Seoul, South Korea. Check back with us for more APPT coverage as the Macau Main Event kicks off on May 21 and runs through May 25. He was the chip leader when three-handed play begun and things were looking great heading into the heads-up battle, but Christian Haggart was just knocked out in second place. On the final hand of the tournament it was Haggart who had the button and he raised to 200,000. Chane Kampanatsanyakorn tanked for a little bit before three-betting to 450,000 and Haggart responded with an all-in shove for right around 1.35 million. "And it's pocket aces for Chane!" the announcer yelled through the room as a huge crowd ran towards the table to follow the action. The board ran out and when the river hit it was all over. Haggart had been knocked out and Kampanatsanyakorn took down the APPT Seoul title one year after losing heads up to Aaron Lim! Right after the hand finished both men shook hands and Haggart congratulated his opponent with his amazing victory. "You're a good man and you played really awesome," Haggart said to Kampanatsanyakorn who was all smiles as could not believe what had just happened to him. The heads-up battle is back underway as we are getting closer and closer to crowning a new champion here tonight! Will Chane Kampanatsanyakorn improve on his second place finish from last year? The players are leaving for a ten-minute break. We'll be back shortly. After trading blinds for quite a while, we finally saw a hand all the way to the river. Chane Kampanatsanyakorn completed the blind and Christian Haggart checked his option. The flop came and Haggart check-called the 60,000 bet of Kampanatsanyakorn. Both players checked the turn. Haggart led for 300,000 on the river. Kampanatsanyakorn seemed confused by this bet and after a solid two minutes, made the call. Haggart showed and Kampanatsanyakorn mucked his hands. The heads-up battle progresses slowly and right now Kampanatsanyakorn's busy slowly extending his chip lead without a pot going over five big blinds. Chane Kampanatsanyakorn raised to 120,000 from the button and Christian Haggart called from the big blind. The flop brought out and both players checked. On the turn the popped up and Haggart bet 125,000. Kampanatsanyakorn made the call and the river brought the completing the board. Haggart checked this time around and Kampanatsanyakorn fired out 150,000. Haggart called and showed but that was no good against . Today A Winner Will be Crowned!